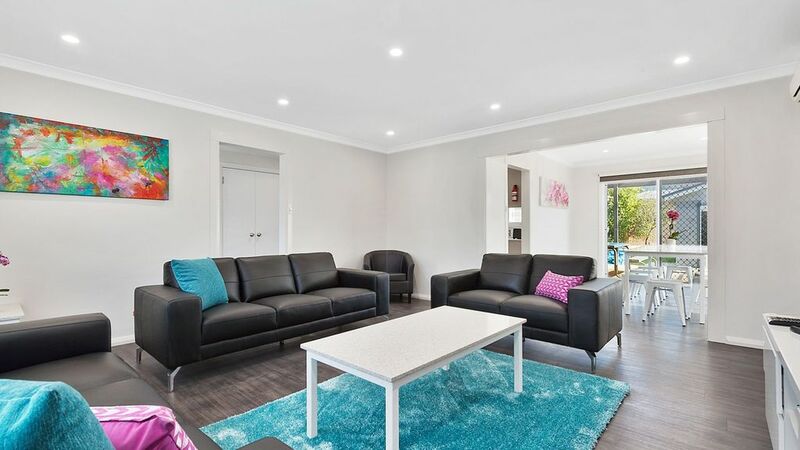 20 on Tolosa is a beautiful, completely renovated 4 bedroom house, perfectly situated in the heart of Glenorchy. This fantastic house is presented to the highest standard and will please the most discerning guests. Central to the house is a stylish, well equipped kitchen featuring stone bench tops, coffee machine, dishwasher, microwave and fridge / freezer. The fully equipped laundry has a front loading washing machine and dryer, stone bench tops, iron and ironing board. Adjoining the kitchen there is a stone top dining table with seating for 8, and a beautifully equipped lounge with leather lounges, large smart TV with dvd selection, wii console and games. The dining area opens out onto a spacious deck with alfresco dining, bbq facilities and a private , secure back yard featuring a separate games room with air hockey, pinball machine, leather lounge, large TV with games. 20 on Tolosa offers 4 bedrooms, all with queen beds, large smart TV's, electric blankets, wardrobe , bedside lamps and clock radios. The large master suite with leather lounge features a beautiful ensuite with stone top vanity, twin hand basins, large shower, heated towel rail, toilet and reverse cycle heat pump. The second bedroom also features a beautiful ensuite with stone top vanity, twin hand basins, large shower, heated towel rail , toilet and reverse cycle heat pump. The main bathroom has a large shower, separate bath, stone top vanity and heated towel rail. The house is heated and cooled by reverse cycle heat pumps. Lovely house suitable for a group of oldies, central to everything. Hosts had the house well supplied for our arrival and very pleasant to communicate with. Thanks for everything. 20 on Tolosa is perfect for a family stay. The accommodation suited our family of 6 adults, 2 children & a 9 month old infant - brilliantly. Portable cot & high chair supplied for our granddaughter, huge tv's in each of the 4 bedrooms, 3 bathrooms & external games room kept everyone happy. The biggest hit was the coffee machine first thing in the morning!! Lovely clean home, thoughtfully presented, including pantry items for our use. Gates provided extra security while children played outside. Close to a shopping centre, supermarkets & takeaway!! Thank you Mark & Miriam for sharing your lovely home with us. The layout of the house was awesome, there were 5 adults staying and each had their own corner of the house without disturbing the others. The amenities were great, especially the big screen televisions in almost every room, the games room was a real bonus as was the cappucino machine. I did not arrive until late and the owners had all the lights and the heater switched on which was a lovely touch after a full day of travel. Will be recommending the accomodation to family and friends that visit tasmania as I was very impressed with accommodation experience. Thank you for a lovely stay in Tasmania. Perfect stay, hosts left no stone unturned! Place was very clean, bright and spacious. Felt like at home. Location was great, close to woolies, coles etc annd only a short drive to city. Communication was great and overall it was very convenient and comfortable. Highly recommended! Very comfortable and clean, we enjoyed the games room! !